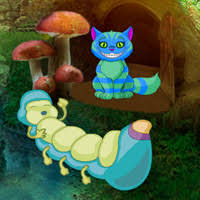 Games2Rule - G2R Fantasy Wonderland Escape is another point and click escape game developed by Games 2 Rule. In this game, you came to see the beauty of a fantasy wonder land. But unfortunately, you noticed that someone trapped you inside this place. You need to escape from this fantasy wonderland by finding useful objects, hints and solving puzzles. Click on the objects to interact with them and solve puzzles. Good luck and have fun! Please stop. I know the backstory - you use that comment to mock someone who wrote it about you. It was unkind of him and, now, of you.. Please end this. Coins and stars are very hard to see. Pay attention in every scene. No need to go outside the game (Google) for the zodiac signs. You will get a book from the well. Where do the cats and the cup go? Nvm, had to go back a few scenes to place the cats. Going back with the train is scary. Looks like it's gonna run you over. Hi joycy :) you ok? I'm sorry to say that I find it amazing how people can bother and think the worst of the best intentions. Enjoyed this game. Thank you G2R! Zodiac messed up-scorpion turned into second crab. Had to restart. Minus points for that.